As MAYA US supports an automatic driver update function in Window 10, most functions supported by MAYA US can normally be used without installing a driver as it is automatically recognized when being connected to USB. When the driver is automatically installed in Window 10, you can download and use the control panel in the following link. 1. Decompress the downloaded MAYA_U5_BSDeck.zip file at C:\. You may decompress at the other route, but, for automatic execution when rebooting, you need to decompress it at C:\. 2. Open the window explorer and move to C:\MAYA_U5_BSDeck folder. - If you run ‘BSDeck_ADD.reg’ registry file, control panel automatically runs when rebooting. - If you run ‘BSDeck_DEL.reg’ registry file, it is deleted from system registry. - In case of 32 bit Window, run BSDeck.exe control panel program file in '32bit' folder. 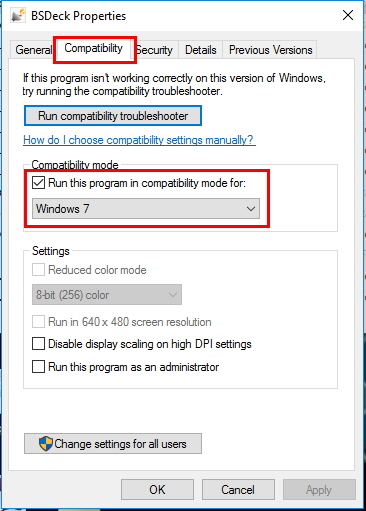 -Click the Windows 7 in the compatibility mode. 3. If you run BSDeck.exe control panel program file, control panel is activated and used in the system tray. ※ When using an analog 5.1 channel speaker, if pressing Enable Stereo Expander, surround is expanded and output. ※ As Stereo Expander expand and output 2.0 channel sound to 5.1 channel sound, when playing 5.1 channel video play, do not press Enable Stereo Expander. If pressing, channel will not be separated!! For other settings, please refer to the manual.